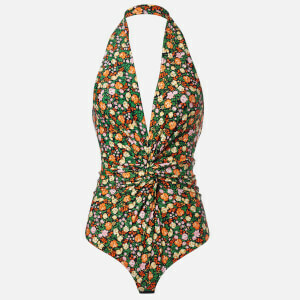 Women's 'Avalon' halterneck swimsuit from Copenhagen-based label, Ganni. Crafted from lightweight, stretch fabric with an all-over leopard print, the fully lined bathing suit showcases a self-tie strap and a plunging neckline. A wrap-style front with a ruffle trim and ruched detail at the hips creates a flattering silhouette.